Keystone XL Pipeline: What Are the Core Issues? In the protracted conflict over the Keystone XL Pipeline, too much attention is paid to peripheral issues and not enough to the core issues. Peripheral issues include whether the pipeline will create many or few jobs, lower or raise Midwest gasoline prices, reduce or increase the risks of oil spills, reduce or increase incremental greenhouse gas emissions. Why are those issues peripheral? Let’s begin with oil spill risk and gas prices. Surely if Keystone is built, there will be incidents of leaks and spills. There will also be regional effects on gas prices. But look at the big picture. The State Department (ultimately, President Obama) is supposed to make a “national interest determination” about the pipeline. 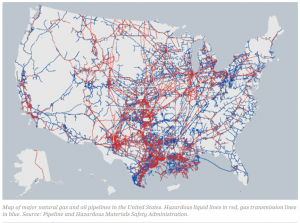 The U.S. already has more than 2.5 million miles of oil and gas pipelines. Can anyone argue with a straight face that the U.S. national interest is harmed by those pipelines? That adding another 1,179 miles of pipeline will push America over some kind of national interest ‘tipping point’? That we would be better off shipping all oil and petroleum products by truck, train, and barge? Or that we’d be even better off if there were no oil companies? Humanity has been there, done that. It’s called medieval squalor. Next consider the jobs debate. Opponents like Bill McKibben argue that, apart from the construction jobs, which are “temporary,” Keystone would create only a “few hundred” permanent jobs, because relatively few people are needed to operate a pipeline once it’s up and running. This is wrong-headed in three ways. First, construction projects are supposed to be temporary. An interminable construction project is an investor’s worst nightmare: behind schedule and over budget. Second, although every project-specific job is temporary, many people who work construction are in it for the long haul – it’s their profession. Several thousand of them would benefit from Keystone-related work. Third, the fact that pipelines require few employees to operate them is a plus. It means they are efficient. Pipelines have a high productivity of labor compared to other methods of transporting oil. This means they are more likely to create wealth (produce more value than they consume). And even under the assumption that all Keystone XL oil is additional oil in the global supply, the extra warming is still less than one ten-thousandths of a degree per year. In other words, if the pipeline were to operate at full capacity for the next one thousand years, it would raise the global average surface temperature by less than 1/10th of a degree! Blocking Keystone would have no discernible climate benefit. So what’s the fight really about? This brings us to the (usually unspoken) core issues. One core issue is whether the U.S. Government should support and encourage or oppose and thwart North America’s market-driven evolution into a world-class energy producer and exporter. Production and export of coal, oil, and natural gas has the potential to add trillions of dollars to long-term cumulative GDP and generate hundreds of billions in new tax revenues. Keystone would help realize that potential by further integrating the U.S. and Canadian oil markets. That, I suspect, is the main reason green groups oppose it. Oil and oil companies are villains in their gloomy narrative of inexorable depletion, dependency, and decline. The prospect of fossil energy-led prosperity threatens their worldview, credibility, and influence. Whatever helps unleash the North American energy colossus, they must oppose. Keystone supporters should push opponents to lay their ideological cards on the table. Opposition to Keystone derives from a broader antipathy to all fossil fuels. Fossil fuels are not perfect, but the alternatives favored by most Keystone foes – biofuels, solar panels, wind turbines – are not up to the task of powering a modern economy. You’re from Vermont? Did you ride your bicycle down here? Did you ride ox cart? How did you get down here? Or do you have a vehicle that runs on hypocrisy? McKibben had no response to this jab. Itinerant preachers of the eco-apocalypse like McKibben, Al Gore, and the throngs of diplomats who attend UN climate conferences pursue a highly, carbon-intensive life style. If even they need oil, then other folks do too. And if oil is an essential commodity, then it should be brought to market by the most efficient means: pipelines. Keystone foes operate on a different maxim. They believe government should empower ‘stakeholders’ (i.e. activists like themselves) to upend other people’s business plans and stifle wealth creation. They think that if they just make enough noise, gin up enough protests, promise or threaten to support or oppose enough politicians, they are entitled to stop other people from taking risks with their own capital, hiring contractors, and employing workers. The conflict over Keystone is thus at bottom a quarrel between those who want to restrain political predation in the marketplace and those who seek to practice such predation. This aspect of the issue, although arguably the most important, has received the least attention. Previous post: Gone with the Wind: Is an Energy Technology Sustainable If It Cannot Sustain Itself?